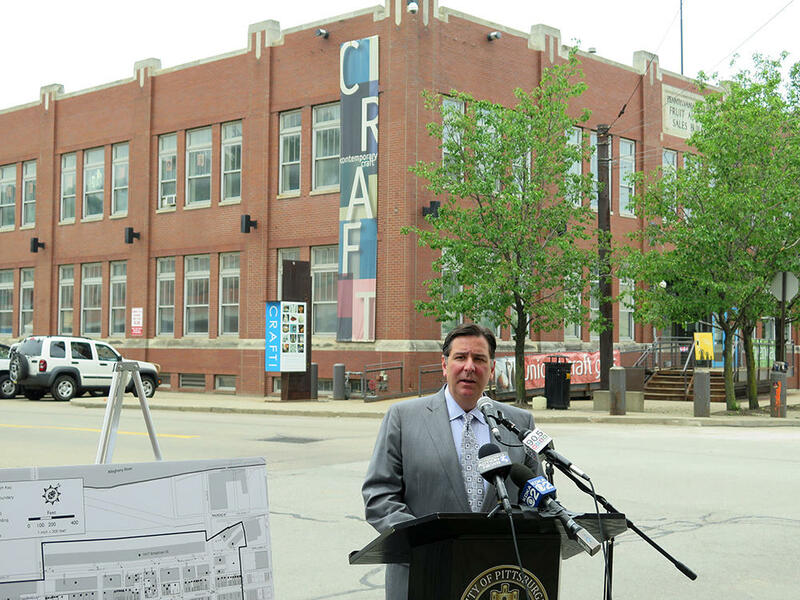 Mayor Bill Peduto announces the naming of Pittsburgh's Strip District as a National Historic District. Pittsburgh’s Strip District has been added to the National Register of Historic Places as a National Historic District. There are currently 18 National Historic Districts registered in Pittsburgh, with the Strip District the latest addition. The 13-block area being recognized will include more than 60 buildings between 15th and 22nd streets and the St. Stanislaus Kostka Roman Catholic Church. Michael Sriprasert, with the Pittsburgh History and Landmarks Foundation, said the designation is a nice honor, but it can also help drive development through tax credits and easement incentives. “The National Registered District not only highlights the significance of the Strip District, but it also brings a number of important financing tools that can help building owners, that can help developers, do restoration, do preservation, and do more development in this area,” Sriprasert said. Two more historic buildings in Pittsburgh’s downtown are set to be restored to their original grandeur. Mayor Bill Peduto announced the restoration of the so-called Skinny Building and the Roberts Jewelers building, both on Wood Street and Forbes Avenue. A vote on whether the Strip District’s Fruit Auction and Sales Building should be designated as a historic structure will be delayed another week. Council’s newest member, Deb Gross, represents the Strip District, and is in favor of preserving the building to the fullest extent possible. “Having said the word 'preserve,' everyone understands that some modifications are going to be needed to that property in order for it to achieve a positive function in the Strip District and a positive function in the business mix,” Gross said.